Not every pattern works on every body type. But when you know what looks good, putting together a flattering outfit is a snap. We’ve got the inside scoop on how to choose a pattern that works for you. We asked Susan Connell, head of women’s fashion at Zulily, the leading daily deals site for women, babies and kids, for her tips on what patterns work best on which body type. Height isn’t on your side, but that doesn’t mean you can’t pull off patterns. “Make friends with vertical stripes that will lengthen your silhouette,” advises Connell. She also notes that vertical stripes convey strength and authority, which is a bonus if you need to present your most confident self. If you’re not into stripes, stick to smaller patterns. “Keep in mind that patterns with elements larger than your fist will overpower your petite frame,” explains Connell. 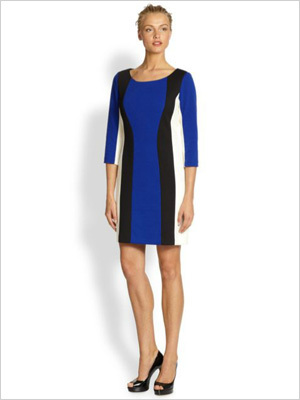 Our pick: We love the bold vertical stripes on this classic shift (Saks Fifth Avenue, $70). If you have a long, lean frame, you have a lot of options when it comes to patterns. “Exercise your right to pull off large and bold prints,” says Connell. “Monotonous prints will make you appear a little lanky, but a bold print will draw the eye toward the torso and away from limbs,” she explains. Our pick: Get noticed in a bold geometric print dress that can easily go from day to night (Ann Taylor, $90). Our pick: Pair this pretty floral print blouse with anything from pencil skirts to denim (Zara, $50). The pear shape’s alter ego is the woman with a fuller bust. Connell advises reversing the advice for a pear shape and choosing a printed skirt or pant to offset a top-heavy appearance. Wearing a pattern on the bottom combined with a more neutral top creates a flattering balance. Our pick: We love this Marc by Marc Jacobs printed mini skirt (Bloomingdale’s, $136). Our pick: Have fun wearing this colorful dress with flattering diagonal stripes (6PM, $25).